The history of the "no crown guard" Submariner is marked by several milestones. Launched in 1953, the very first serially produced Submariner wristwatch carried the designated reference 6204. Displaying pencil hands and luminous numerals, it was an incredibly important aid for dives. 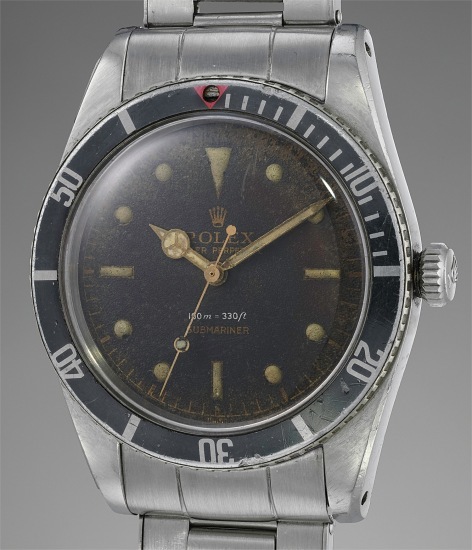 Rolex eventually developed other "small crown" models, such as references 6205, 6536/6538, 6536 and 6536/1, while references 6200, 6538 and 5510 were fitted with a "large" crown. Reference 5508 was the last Submariner to carry the "100m=330ft" depth rating. In production from 1957 until the early 1960s, reference 5508 is known as the "James Bond" Submariner in the collecting community. This particular example is very well-preserved over time. The case is in excellent condition with sharp bevels and crisp edges. Furthermore, the inside case back is stamped III.1958, which is correct. This timepiece comes with a "Big Logo" Rolex bracelet, which is particularly beloved by collectors today.